As Maharaj shri has emphasized “Service is not simply a matter of monetary help, whatever you are capable of and in whatever way you deem fit you can render your support to me”. At SRLKT, the focus is on volunteerism which covers every aspect of work that would help us to further our mission and its goals that have been set forth by Maharaj shri. Starting from contribution of physical work for constructing ashrams, administrative & financial management of ashrams, its day to day activities and finances, organizing events and programs for religious, spiritual and social causes. We are always in need able minds and bodies who believe in higher values and are in search for a deeper meaning to their lives. 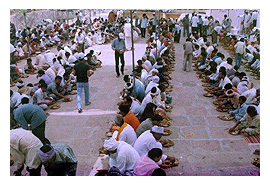 Maharaj shri says, "Every person should offer at least 7 days of selfless service in a year towards any activity of the Trust that is of his or her interest"
Multiple projects are managed under the supervision of the Trust for humanitarian, educational, environmental, healthcare and spiritual causes. You can review the details of these projects and can provide monetary or administrative support for any one of them based on your interest. "In the world take always the position of the giver. Give everything and look for no return. Give love, give help, give service, give any little thing you can, but keep out barter. Make no conditions and none will be imposed on you. Let us give out of our own bounty, just as God gives to us."